This little dropleaf table is one of my new favorite things. It’s tiny, but packs a punch I think…kind of like me! I found it on the side of the road last summer and painted it a beachy blue, but haven’t really loved it. Then, Maison Blanche came out with a new color, Collette, and I knew it would be perfect for my little table as well as a few other items I have stashed in my garage. 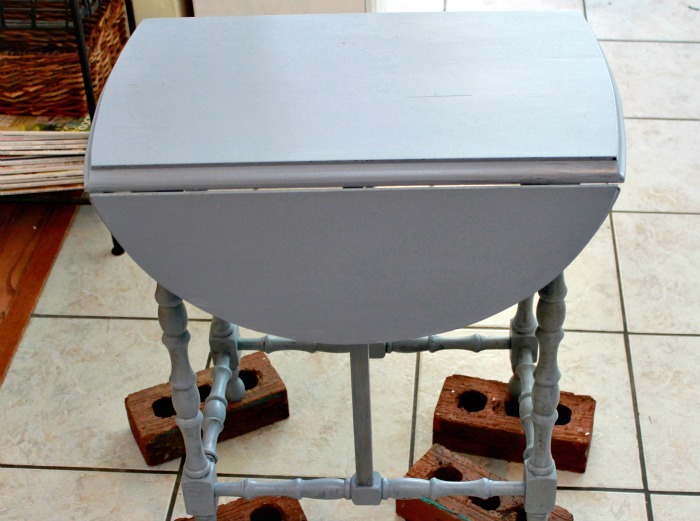 See…this little table it is cute, but it isn’t fabulous. It’s just…meh. But now, after two coats of Collette and a nice coat of Maison Blanche wax…oh, she does sing! Maison Blanche’s La Craie is a premium Furniture Paint. Our exclusive formula contains calicium carbonate allowing adhesion to almost any surface, and it truly does just that…sticks to virtually any surface without primer or sanding. The wax helps to seal and protect your painted surface, and it also makes the color pop. I didn’t actually use the Collette straight out of the can. I am saving that fabulousness for another project. I decided to mix the Collette with some Magnolia (Maison Blanche’s version of white). I simply mixed 1 cup of Collette and 1 cup of Magnolia and mixed them together in a glass dish and this is the color I got…Magnollette maybe? The wonderful thing about the Maison Blanche paints is that you can mix them to make different colors, and as long as you actually measure them, you can recreate the exact same color over and over again! I now dub her Miss Magnollette, and I just love her. She is simply sweet. I can totally see myself sitting here reading a nice book and having a glass of sweet tea. 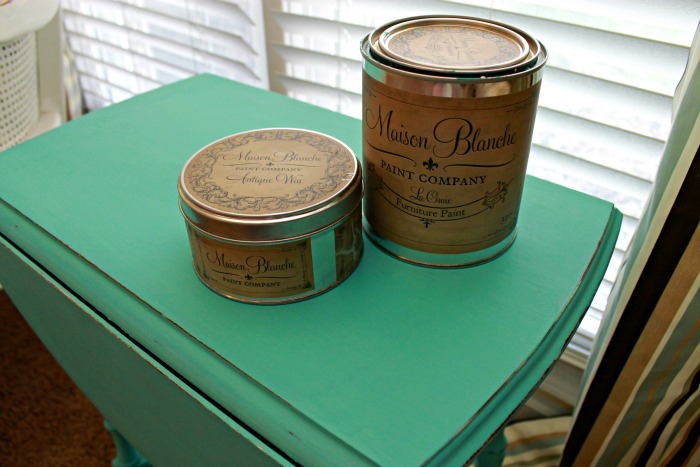 Have you ever used Maison Blanche Le Craie paint? Do you want to? You know you do! And you know what? 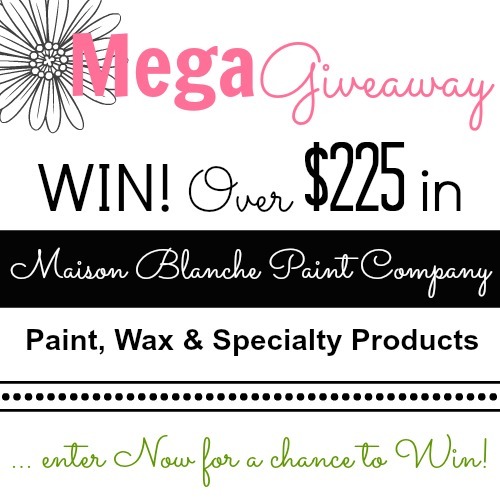 You are going to get the chance to win your choice of their paint and soooo much more! Two(2) Quarts of La Craie furniture paint in the color of their choice. One(1) Tin of Antique Wax in the color of their choice. One(1) Glacage Embossing Creme in the color of their choice. One(1) Organaza Shimmer Coat in the color of their choice. One(1) Le Craque Crackle Medium. One(1) Le Dirt Antiquing Dust. So, what are you waiting for? Good luck!!! Me! Me! This would be fantastic, yo!!! This could not have been a more perfect color choice for you Jessica! Love it! I am just starting my company. I would love the opportunity to try this paint! This color really pops! Just beautiful! what a great little giveaway. I tried to enter by something is wrong with raffle widget (it’s been reported). 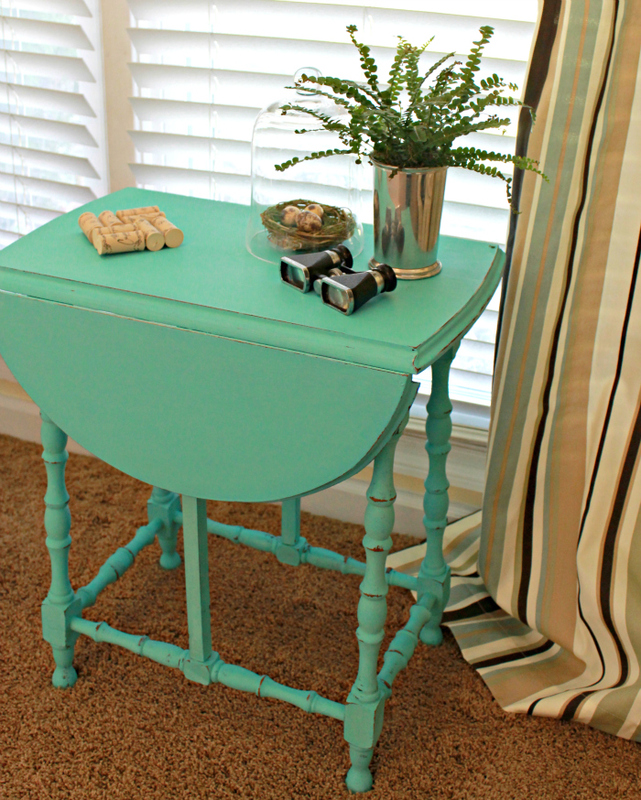 I agree that little table is so cute with the new color. Thank you, Laura. Just checked the rafflecopter and it seems to be working now. What exactly wasn’t working for you so I can be sure to check that in particular. I would love to try the paint! Great giveaway Jessica!….Love Annie’s paints…her colors are wonderful! 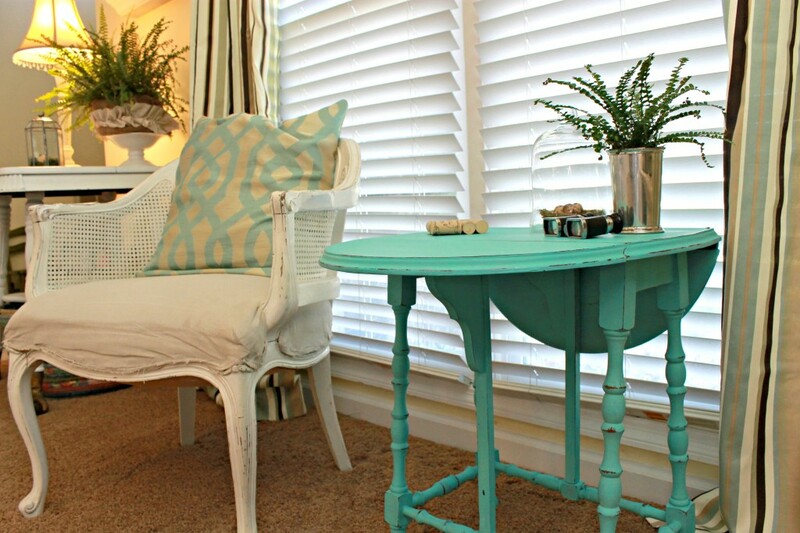 OMG- love that little table..and I want I want I want!! I think you found the perfect color for your little table, Jessica. Love it! Thanks for the hosting such a wonderful giveaway. Do people in Kentucky always throw fabulous furniture out on the side of the road? You have some amazing roadside finds. I’m so jealous. Ready to go curb-surfing on trash night around these parts to see what I can find. I usually am terrified to pick bold colors but I love how cherry your table turned out!! I might have to broaden my paint pallet! Thanks for the inspiration! What a sweet roadside find! I’ve not heard of this paint before but would love to give it a try. Such a spectacular giveaway! Love, love, love this color! 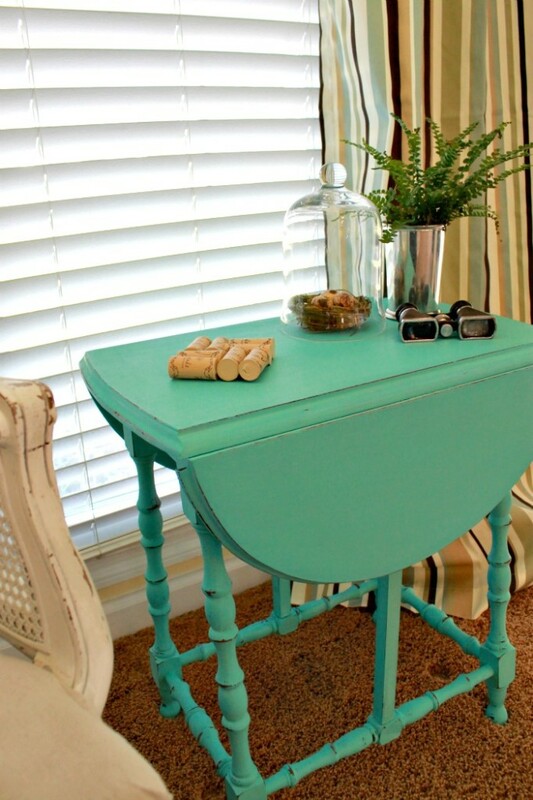 I am trying to add more turquoise to my house and this is the perfect shade. Good job! The only thing I love more than this drop leaf table is the color! It just pops! I am all about trying as many paints as I can …hence the name Givemeapaintbrush! WOuld LOVE to try this one too! That drop leaf table is to DIE for! And the color is absolutely stunning! I love the color, I just saw the green color that Debbiedoo’s painted some of her items and I LOVE that color. I have some furniture that needs to be brightened up and fixed, this paint would definitely do that. I have to mention, I am not sure I am copying the URL for my Facebook share properly, but I have shared it. So pretty! I love the color. I haven’t heard of this paint but signed up for the give away. TFS! I’m visiting you today from Flamingo Toes. I hope you get a chance to stop by my blog and leave a comment and Link Up, too! There certainly is a lot of punch packed into that cute table! LOVE it!! Your table is amazing…the color is amazing…and I would love to try that paint in the same color as your table.